Reading and share top 4 famous quotes and sayings about Faithful Servants by famous authors and people. Browse top 4 famous quotes and sayings about Faithful Servants by most favorite authors. 1. "If you be faithful, you will have that honor that comes from God: his Spirit will say in your hearts, Well done, good and faithful servants." 2. "A friend is a possession we earn, not a gift. ....The Lord has declared that those who serve him and keep his commandments are called his servants. After they have been tested and tried and are found faithful and true in all things, they are called no longer servants, but friends. His friends are the ones he will take into his kingdom and with whom he will associate in an eternal inheritance." 3. "If you only notice human proceedings, you may observe that all who attain great power and riches, make use of either force or fraud; and what they have acquired either by deceit or violence, in order to conceal the disgraceful methods of attainment, they endeavor to sanctify with the false title of honest gains. Those who either from imprudence or want of sagacity avoid doing so, are always overwhelmed with servitude and poverty; for faithful servants are always servants, and honest men are always poor; nor do any ever escape from servitude but the bold and faithless, or from poverty, but the rapacious and fraudulent. God and nature have thrown all human fortunes into the midst of mankind; and they are thus attainable rather by rapine than by industry, by wicked actions rather than by good. 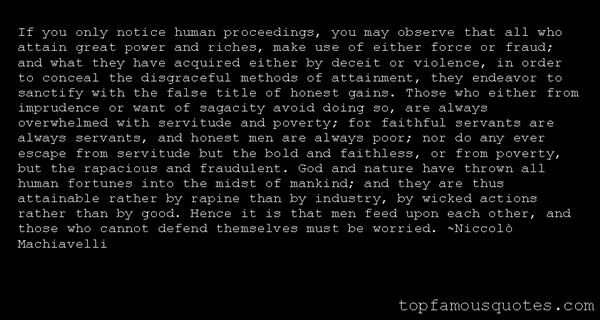 Hence it is that men feed upon each other, and those who cannot defend themselves must be worried." 4. "Faithful servants never retire. 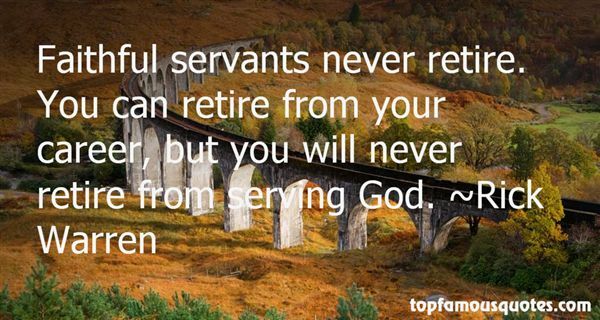 You can retire from your career, but you will never retire from serving God." Luck is everything... My good luck in life was to be a really frightened person. I'm fortunate to be a coward, to have a low threshold of fear, because a hero couldn't make a good suspense film."